List of GD Topics For Interview in PSUs/ NITIE Mumbai/IIT M.Tech - By S.K Mondal Sir - Sarkarinewjob.com A ultimate job portal to provide employment news. Hello Engineering students. 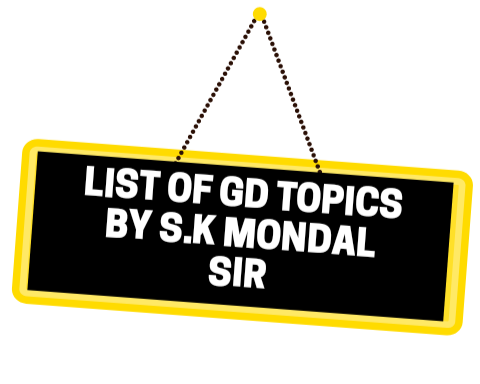 We are providing here important GD topics list given by S.K Mondal Sir THIS LIST IS VERY BIG. PREPARE FEW POINTS ON EACH IF POSSIBLE SO THAT YOU ARE ABLE TO SPEAK ON ANY TOPIC. How demonetization is affecting common people more than black money holders! 6. Loan waiver of Farmers is it justified as per Economy or is this only option we have? 9. Uniform civil code: Should India have a Uniform Civil Code? 14. R we heading towards Hindu Rastra? 15. Triple talak : Should triple talaq be abolished from India? 16. Should India also do operations like to kill Osama by USA? 18. Digital india boon or curse. 19. Should rural people be given internet without proper knowledge?? 20. Should there be Education qualifications for politicians. 25. Do ranking and grading decides a university education level actually. 26. Kashmir Solutions & Should Pellet guns be banned? & Kashmir after Bruhan Wani’s death. 27. Is education System killing the natural talent of youth. 28. Good terrorism vs Bad terrorism. 29. Present election: Are we going away from basic social problems on which election should be based. 30. Should national anthem be played in theaters. 31. Should Pakistani artists be banned from working in India? 32. Adhar card: How safe is one's Identity. 33. Is India a secular​ country? 35. Should aadhar card be used at all platforms. 36. Shivaji smarak in Mumbai tourism or vote bank politics. 39. Is jio way of doing the bussiness right or wrong. 40. Start up India stand up India - prospering entrepreneurical culture. 41. Indian media doing reporting, TRP or paid news. 42. Jalikattu and bail gadi race allowed or banned. 43. Brexit goot or bad for world economy. 44. Does INDIA need mars mission or another green revolution. 45. Current West Bengal situation i.e, illigal migration. 46. Nepotism in Bollywood/Politics right or wrong. 47. Should yoga be made compulsory in schools. 48. Should news media be given right / left Identity. 49. Merits and demerits of cashless economy. 50. Justice delayed is justice denied .is Indian judicary effective? Example Salman Khan Case. ....& Kashmir boy who spent their half of age in prison & found innocent..
51. Is India ready for precidential debates & election like US ,what r challenges? 54. Quality Education V/s fees of private & government institutions , merit-demerits ? 56. Is demonetisation successful wrt Terror funding & collection of black money? 57. Should​ Political parties fund collection come under RTI ? 58. Attacks on immigrants how to deal with it ? 60.Are we under dictatorship government means what to eat, what to wear, what to say & chant slogan about ? 62. Bullet train is it necessary or do we have to strengthen our present quality of facility , security & emergency services? : Bullet train or Better trains - What does India need? 65. should airlines banned the flyers? 66. Clean ganga project is government priority or just vote bank?? 71. Will new note of rs 2000 able to curb black money ? 72. Can we dream of hosting the Olympics? : Should India host Olympics 2020? 73. What would be government & citizen's role to make INDIA ""viswa guru"" the future leader in world by 2030 ? 74. Identity: what to share & what not with government , is it our rights? 77. Shouldn't​ cricket be India's national sport ? If not now then why? 79. Is the Consumer really the King in India? 81.Is Foreign Direct Investment (FDI) in retail sector good for India? 82.Can the world economy bank upon India for growth? 85.Is India a secular country? 86.Should public sector be privatised? 87.Do we really need Smart Cities? 89.Should single-point GST be implemented? 90.Merit or Seniority – Better criterion for promotion? 93.Demand for new states, is it justifiable? 95.Is management art or science? 96.Should there be exemptions in odd-even rule? 97.Do brands rule our lives? 98.How would the victory of Donald Trump in USA impact India? 101.Should India destroy the terrorist camps in Pakistan? 102.Are women better managers than men? 103.Should reservation in higher education be allowed? 104.100 percent FDI in E commerce - what it means to retail business? 105.India or Indians Who Is Performing Better? 108.Population of India an asset. 110.Merits and Demerits of cashless economy. 112.Developing an entrepreneurial ecosystem in India. 113.Ensuring gender diversity in Indian work force. 114Making Indian Banking system more inclusive. Planning Commission or Niti Ayog – Would the change in name matter? 117.How escalating pollution rate in India can be controlled? 118.Is it fair to spare political parties from income tax investigation? 119.Should referendum be used as a method to take important strategic decisions? 120.How digitization is strengthening Indian Democracy? 125.Online shopping- a boon or a bane? 127.Television – an idiot box or a useful resource? 131.Will Donald Trump’s presidency be a bad news for women? 133.A ship docked in harbor cannot face the storm! 135.FDI in retail- Boon or Bane? 136.Technology is a double edge sword. It should be managed carefully. 137.Bureaucracy or Democracy - Which is better?